The term ‘Sports Driving’ is relatively new in the field of equestrian sports. This book demystifies the ‘myths’ of competitive carriage driving. It contains advice on acquiring the right pony and equipment, schooling to achieve results and how to turn out yourself and your pony at a National Championship. 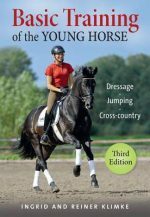 The author details all three phases of competition with tips on achieving flow and bend in dressage, speed in the marathon and accuracy in cones. Amanda Saville travels throughout the country with her ‘Chariots of Fire Display Team’ and in 1999 started the Chariots of Fire Driving Centre. In 2003, she set up the first carriage driving club dedicated to bringing children into the sport. She was National Indoor Champion 2004/05, Scottish Indoor Chmpion 2007, 2005/06 and 2004/05 and Indoor Pony Pairs Champion 2007.